e-Media of New York Inc.
e-Media of New York Inc., New York’s Premiere Full Service Computer Company, was established to serve the needs of small businesses in the New York area. e-Media of New York Inc. provides a well established track record for meeting the demands of clients both current and future. e-Media of New York Inc. offers competitive pricing for all its services. We will be there to serve you in the future as well, with cost effective service contracts as well as other media and service products. With alliances with certain manufacturers we are able to provide you with cost effective software and hardware solutions. You are now provided the ability to get both your hardware, software, and installation from the same company. e-Media takes Manhattan! 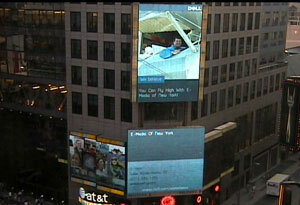 Click here to see our ad posted in Times Square in association with Dell. eMedia was chosen by Dell Small Business for this special honor because of their unique presentation, and the way they demonstrated their commitment as a small business.